Finding an ideal massage chair can be a demanding task, especially with so much competition on the market. Many massage chairs promise to have it all, and it’s difficult to know which company to trust. Kahuna massage chair may come from an off-brand company, but it boasts with many satisfied and loyal users. The SM7300 massage chair promises to fit even taller users, and it seems to be extremely beneficial for those suffering from chronic pain. 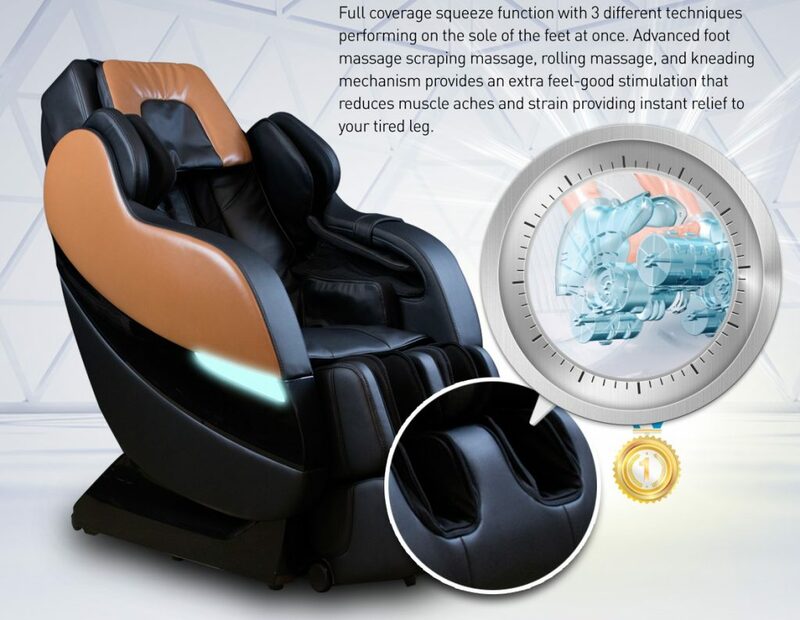 Let's dive in and find out if this massage chair is something that you can fully benefit from. Check our guide here to find out which model is the top rated massage chair in the world right now! A lot of massage chairs are able to accommodate users up to 6’ max, but the Kahuna SM-7300 promises to accommodate taller users, those with chronic back pain. And those who are looking for a therapeutic massage chair that won’t let them down. 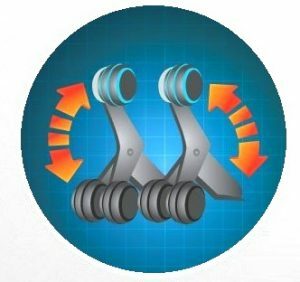 A hybrid S- and L-track design brings the users the combined benefits of both. The S-track follows the natural curve of your spine, while the L-track is able to extend all the way to the glutes and thighs. This is a very strong start for Kahuna, and it results in a high-quality massage, which is both very beneficial and satisfying. An upgrade which will improve the massage quality even further is the six-roller system. The standard quad-rollers may provide a massage that resembles the human hand massage experience; there’s no doubt about that. But, the extra rollers provide more advanced massage modes that are even more soothing and therapeutic that the quad-roller experience. The massage chair scans your body before the massage to locate all your pressure points and to adjust the rollers accordingly. This is a very beneficial feature that definitely improves the massage. What’s best with this Kahuna SM7300 is that the user has an option to manually adjust both the rollers as well as the width of the massage area. This is an excellent addition and a rare one in this price range. When it comes to massage options, Kahuna SM7300 has five massage techniques available: kneading, tapping, a combo of kneading and tapping, knocking, and shiatsu. 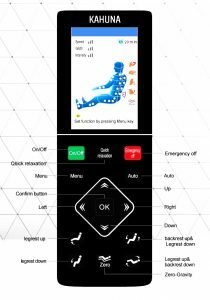 In case these are not what you want, you can always customize all the massage options through one of the three intensity level settings. A very welcome feature yet not too common is the Zone massage mode. This means you can stop the massage every time the roller hits a sensitive spot. Press Zone on the remote and the SM7300 is able to focus on that particular area within six inches. Last but not least, the massage of Kahuna Superior is set to ten-minute default duration. 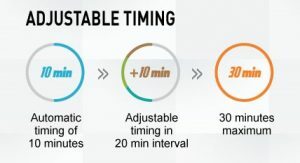 With an adjustable timer, you can freely adjust the time of the massage anywhere between ten to a maximum of thirty minutes. 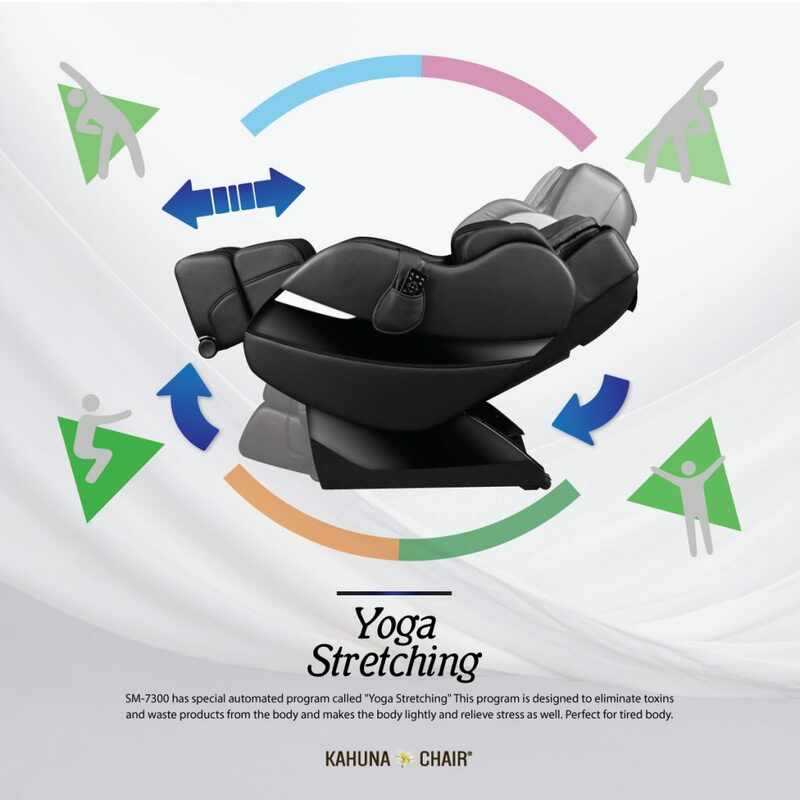 Apart from the extensive massage options, Kahuna decided to spoil its users a bit more with the Yoga stretch function. The body stretch is meant primarily for those who suffer from the back pain. This function is able to provide an immediate relief, by taking the pressure off your spine. This feature is quite strong, but very useful and beneficial nonetheless. Many of other Kahuna massage chairs come with at least two different heat therapy locations, but SM7300 only provides the heat for the lumbar area. This function is more than beneficial, and all those suffering from chronic back pain welcome it with open hands. Because this massage chair has so many upgrades, this feature is a bit disappointing. Another downside is that the temperature cannot be regulated; you can turn it on or leave it off. The zero gravity feature is a very beneficial feature, available in most massage chairs. While some massage chairs offer three Zero-G levels, this Kahuna massage chair only comes with one level. By placing you a reclined position, the chair is able to provide a more thorough and even deep tissue massage because your body weight is pressing down against the rollers. In a combination with the six-roller system, the massage is even deeper and more superior. A common yet welcome feature, Kahuna SM7300 has 18 airbags placed on the chair. While other massage chairs offer even up to 107 airbags, we find this specific feature slightly under the standard. There is no doubt that this massage chair still provides an excellent massage with its 18 airbags. The best part is that you can adjust the intensity of the airbags through three different levels. Kahuna Superior provides a good calf massage with the airbags located in the leg ports. The unique feature of the foot massage is that there are three different massage techniques for your feet: scraping, rolling, and kneading. These provide an instant relief since all three work at the same time. This is a rare if not even an exclusive feature of the Kahuna Superior massage chair. While the remote control is fairly simple, it might still need a small learning curve. After all, Kahuna Superior massage chair comes with an extensive amount of features. The remote is relatively easy to use and well designed. An extra addition that you may find quite likable are the LED lights on each side of the SM7300 massage chair. In a dim light, these lights offer a calming glow that helps you relax and boost the whole massage experience even more. Kahuna SM7300 comes from an off-brand company. You can find more information about them on their website. Kahuna massage chairs are manufactured by the AJX.LLC, a company that was formed already in 1997. They claim to provide only the best quality massage chairs to their users. Kahuna Superior comes from an off-brand company Kahuna. The massage chair is made in China. 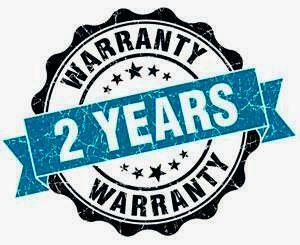 The SM7300 comes with a two-year warranty which you can find here. You can also find the manual pdf file along with an installation guide which is available on the Kahuna website. The Kahuna company offers a free delivery of the chair. We recommend you to purchase an additional White Glove delivery service since the chair is quite heavy. SM7300 massage chair comes in three colors: black, coffee brown, and dark brown. We believe it’s made with synthetic leather, and it comes with a nice addition: you can unzip the covering to replace it when it’s used up and old. The SM7300 is able to accommodate users up to 6’5” and 320 lbs., but the chair weighs 246 lbs. More or less in the same price range, RelaxOnChair may not be as well-known as Kahuna, but many online reviews claim it definitely deserves more attention. With a Hybrid S/L-track design, both massage chairs are able to provide you with an excellent massage. While the Kahuna massage chair comes with an advanced six-roller system, the MK-IV has quite a short L-track, and it doesn’t extend all the way to the thighs. While we’re sure the MK-IV massage is excellent, the Kahuna superior in this feature. 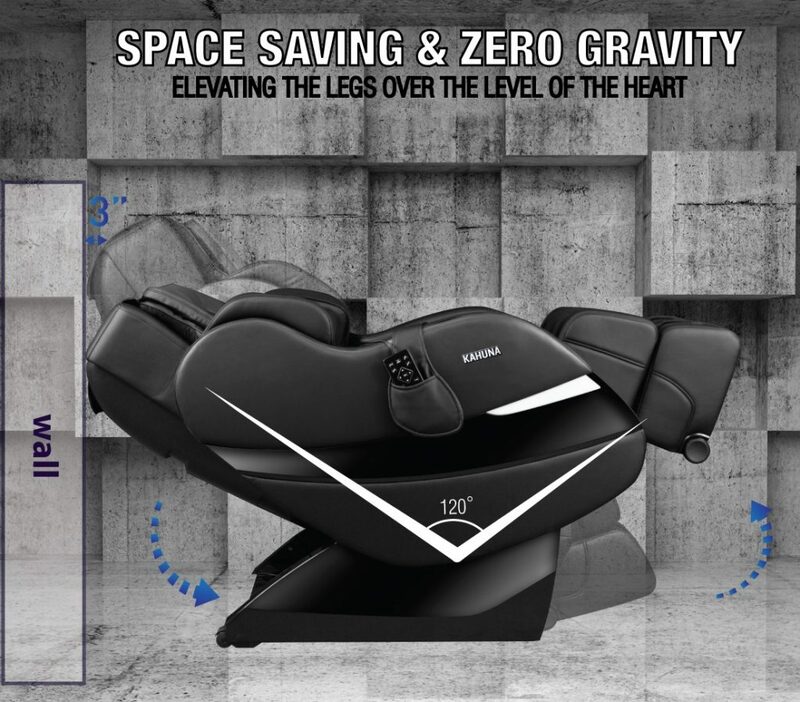 Zero gravity seating is an important addition that’s both therapeutic and boosts the quality of the massage. 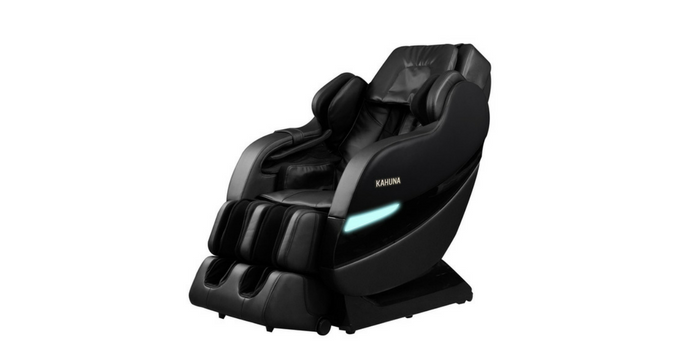 To provide the best massage experience, Kahuna Superior comes with one level Zero-G, while the MK-IV massage chair comes with three-level gravity. When it comes to massage options, the SM7300 comes with five massage techniques, five auto massage programs, and four massage modes. A lot of these options can be customized. As an addition, the Kahuna also offer zone massage mode, which is definitely very beneficial. The RelaxOnChair, on the other hand, comes with two pre-programmed massage programs and five massage techniques. All of these options can be adjusted via three different levels of speed and intensity. 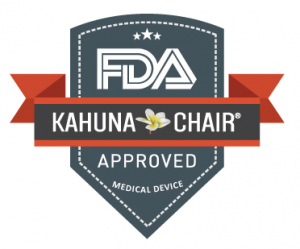 Kahuna Superior and RelaxOnChair both come with a full body scan, body stretch, and heat therapy. Both massage chairs are an excellent choice for the casual users and those who need a therapeutic massage on a regular basis. 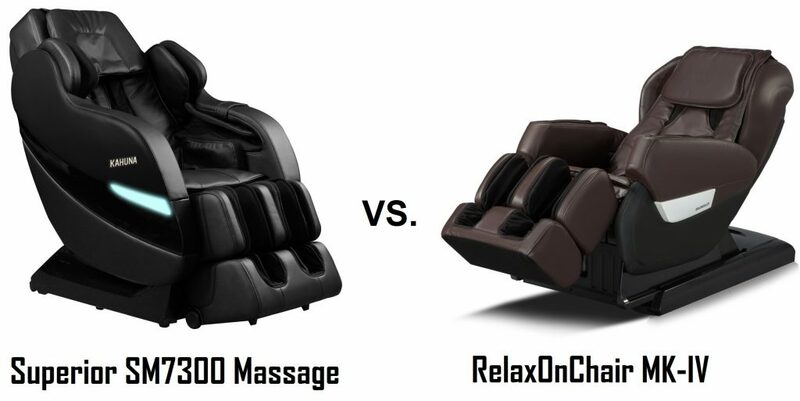 The differences between the two massage chairs are minor, but at the same time, we’re convinced the Kahuna is the superior massage chair of the two. It comes with a wider array of massage options, and the six-roller system. Coming from the same company, Kahuna always provides the market with quality massage chairs that are quite popular among their users. 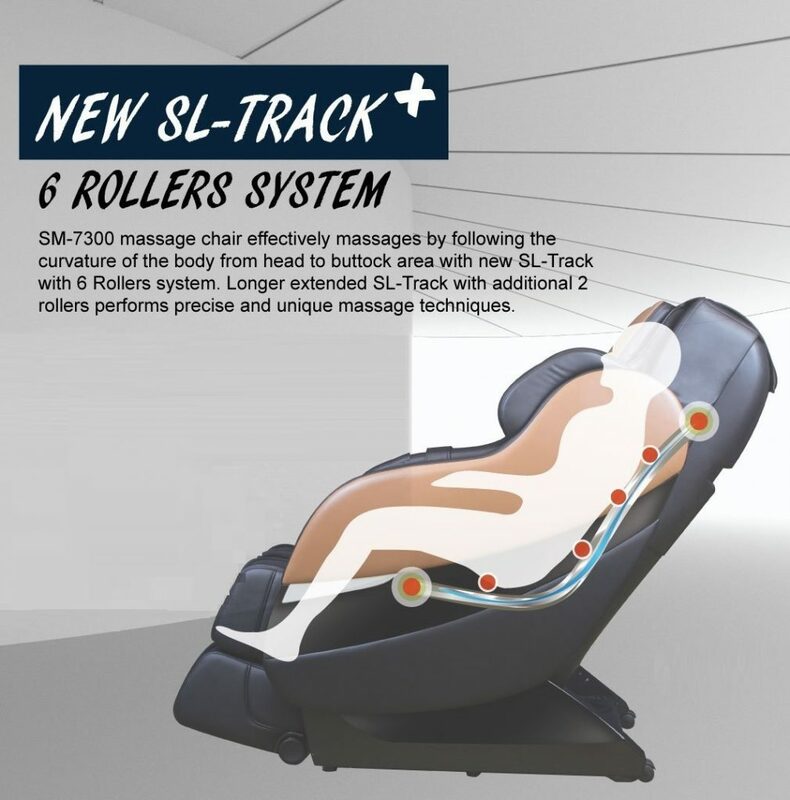 The SM7300 comes with a Hybrid SL track design, which is very beneficial and provides an excellent massage in combination with the six-roller system. The LM700 massage chair has the L-track design and the four-wheel massage system. These chairs both provide immense health benefits and improve massage experience. 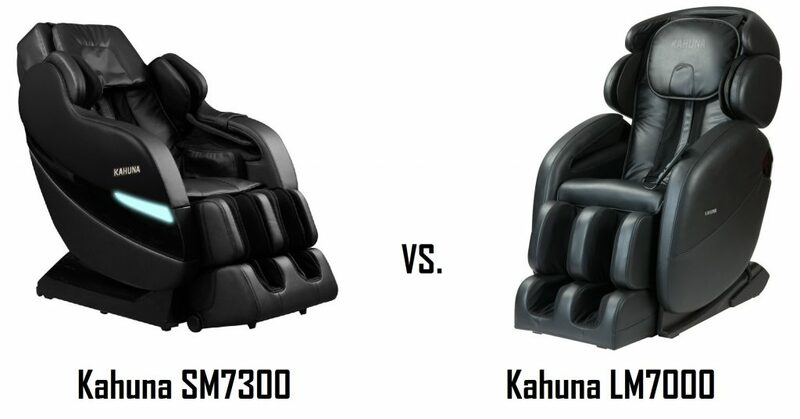 Kahuna SM7300 offers a wide variety of massage options, which can please even the more demanding users. At the same time, the LM7000 is quite extensive in what it has to offer as well. An auto-stretching feature, combined with five massage modes, is also very beneficial. With its anti-stress mode, it targets the user’s stress level, providing the best it can. Kahuna LM7000 comes with dual foot rollers that relieve the soreness in the feet and soothe them. In a combination of airbags, the massage is very relaxing. SM7300 massage chair goes one step further, by incorporating three different techniques on your feet. An extremely soothing and beneficial feature you won’t get easily in any other massage chair. Both massage chairs are beneficial in therapeutic; most importantly, they provide excellent value to their users. Since we’re choosing between the two Kahuna massage chairs, we’d say they’re both good choices and, according to many online reviews, you shouldn’t be disappointed. They both come with advanced features that provide therapeutic massage. But our preferences are with the Kahuna SM7300. The LM7000 is definitely a good competitor, but we’re convinced that the SM7300 provides more value, more soothing relief, and is superior with its features and massage options. 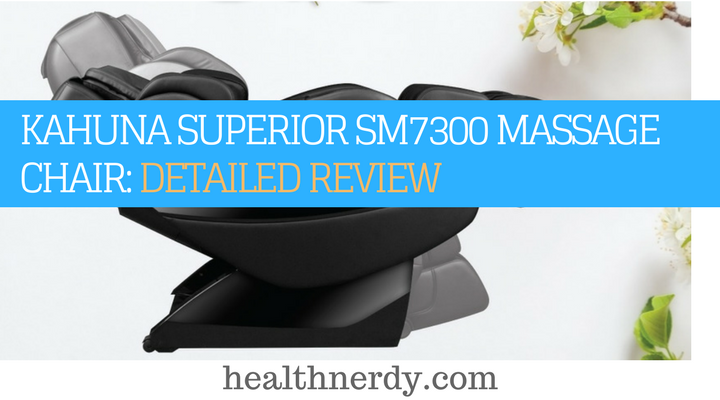 With the extensive features, the Kahuna Superior SM7300 massage chair is impressive. It has a number of benefits and additions that can cater to many different wishes. The best part about it is that it can accommodate taller users which are very often neglected. Apart from that, this massage chair can provide an instant relief to all those suffering from a chronic back pain. After all, it comes with a space-saving design, six-roller system, and an advanced yoga stretch. We’re convinced this massage chair is an excellent value for money, but have a look at some of its competitors anyway.